MTMS combines tire uniformity, dynamic balance measurement and tire geometry inspection into a single process for passenger and light truck tires. In its most efficient configuration, the total system cycle time is the fastest in the industry. In addition, each individual measurement station insures the best measurement with no compromise in precision and accuracy. The ASTEC® PLUS is the latest edition to the family of uniformity measurement systems created and manufactured by Micro-Poise. The ASTEC® PLUS measures force variations, runout, and sidewall appearance. This is the first measurement machine that the tire encounters as it enters the MTMS module. Click Here for more information on the ASTEC® PLUS. The AkroDYNE® Dynamic Balance System is the second and last measurement machine the tire encounters while in the MTMS module. 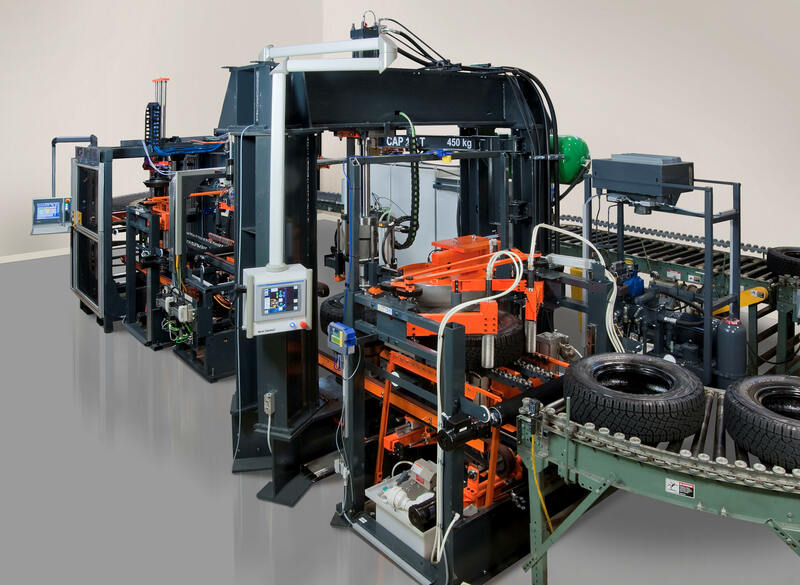 This machine helps assure tire quality by measuring and grading tries according to static, couple, and upper and lower plane imbalances in a wide variety of tires introduced into the machine. The AkroDYNE® features the fastest cycle time of any commercially available dynamic balance system. Click Here for more information on the AkroDYNE® Dynamic Balancing System.